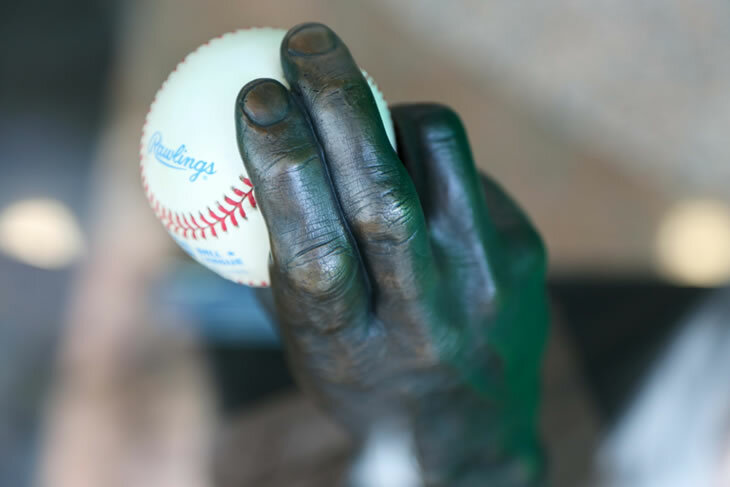 In recognition of our local baseball team, the Colorado Rockies, the Art and Culture Program at Denver International Airport is pleased to present A Show of Hands, a cast bronze exhibition including some of baseball’s greatest players. The display is on view in Jeppesen Terminal, Level 5 southeast, baggage claim area through mid-July. Local artist Raelee Frazier of Highland Studio has made a career casting the hands of well-known public figures, many of them baseball players. Bronze casts of the hands of baseball’s Todd Helton, “Buck” O’Neil, Ted Radcliffe, Greg Maddux and “Goose” Gossage are on display. The hands are presented gripping a baseball bat or baseball. Also on view are the cast hands of John Elway and Boston Pops Orchestra Conductor Keith Lockhart, as well as several privately commissioned pieces. Raelee Frazier is no stranger to long hours of difficult and detail-oriented hard work. She has been serving the Denver area arts and museum community as an artist and mold-making specialist for more than three decades. Years of practical experience in creating life casts for exhibits in local and national museums and mold making for the bronze process preceded the conceptualization of the first prototype for casting hands in bronze. Frazier originally gained baseball contacts through a collaborative effort with major leaguer Charlie Metro. Her partnership with Metro endured and prospered through the years until his death in 2011. Charlie provided introductions to the sports community and Raelee worked her magic in casting. The end result of this collaboration has become a significant contribution to the history of baseball and sports memorabilia. The life cast bronze sculptures capture the touch, power, and detail of the great hitters of the game standing at the plate waiting for the next pitch. Frazier has expanded the scope of her work to include other sports and areas of interest other than baseball. She has cast the hands of baseball and football greats, golfing legends and the high priest of mountaineering Sir Edmund Hillary. Frazier also takes personal commissions.